A fire broke out at Notre Dame Cathedral in Central Paris yesterday afternoon, a spokesman from the fire department said. Smoke could be seen billowing out from the top of the medieval cathedral, as flames leaped out besides its two bell towers, witnesses said, while black smoke was seen shooting from the base of the spire, which is undergoing renovation. The fire spread rapidly through a major portion of the magnificent Gothic cathedral at the heart of Paris. 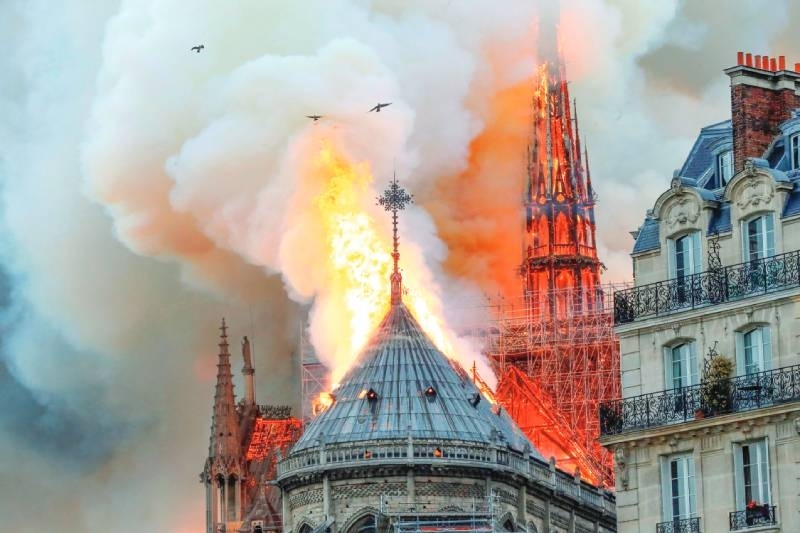 The Paris mayor, Anne Hidalgo, said the fire service was currently “trying to control the flames.” The soaring spire collapsed in flames, and a church spokesman says the entire wooden interior of the 12th-century landmark is burning and likely to be destroyed.